The Rhone Rangers are riding into Boston! Trade & Media Seminar, 12 noon - 1:30pm The Rhone Rangers will present a “State of the Rhone Nation” seminar, open to trade and media, which will provide an opportunity to understand the taste profiles of the principal Rhone varieties and will include wines from Tablas Creek Vineyard (Paso Robles), Margerum (Santa Barbara County) Miner Family Winery (Napa Valley), ONX Wines (Paso Robles), Ridge Vineyards (Sonoma), Four Lanterns (Paso Robles) and The Withers Winery (El Dorado). Complimentary to qualified members of the Trade and Media with pre-registration required, includes Trade Tasting, or $45/each Consumers. Limited seating. To RSVP, click here.To RSVP, click here. Trade Tasting, 1:30-4pm Fourteen wineries will pour more than 50 wines for the wine trade and media. 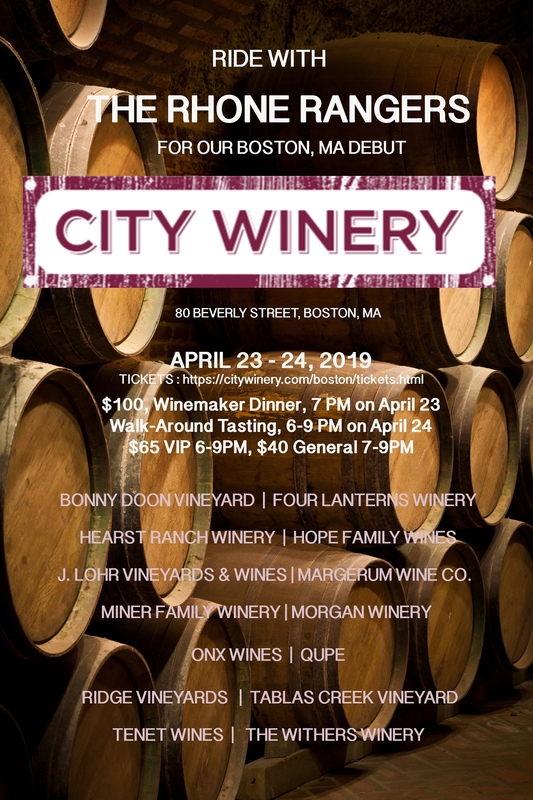 Tickets are complimentary for those who directly influence the purchase of wine including sommeliers, chef-restaurant owners, wine writers, wine retailers, wine wholesalers, distributors and brokers. To RSVP, click here.